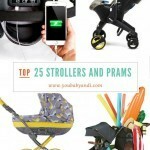 Those eagle eyed regular readers will know all about my love of a good quality pushchair and that a few weeks back we were very honoured to be invited the launch of the newest addition to BabyStyles award winning arsenal …. The Hybrid. 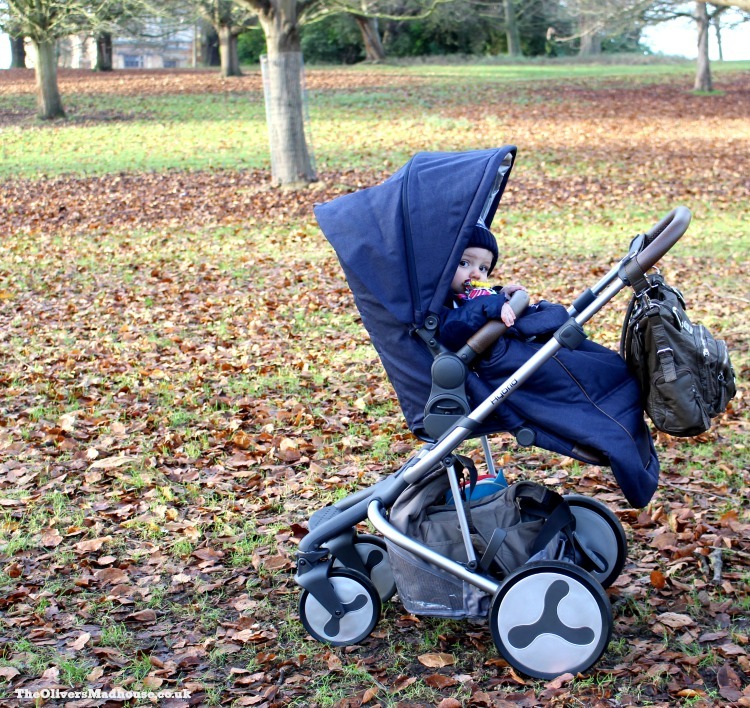 At the launch I was really excited with the Hybrid, the adaptability of the pushchair from single to double with just a quick click of an adaptor or 2 is certainly one of them. I have been very honoured to have been sent a Hybrid Edge in navy to test drive in real life with baby Jacob and we couldn’t wait to put it together. The box is super compact when it arrives and it threw me slightly that it could be in a box that small! However I am really pleased to report that it is in fact all in there! It was also lovely to put together too with some amazingly detailed instructions it was actually super easy to put together without needing a degree either! I was so eager to try the Hybrid out that I didn’t make an unboxing video, however the wonderful Julie from Pondering Parenthood has created an unboxing video that you might find useful so have popped it below for you. The BabyStyle Hybrid has some incredibly well thought out features, from it’s wonderfully spacious seat unit. To large hood with large sun visor which is super for keeping those little peepers shaded. And it has been wonderful especially when he has fallen asleep in the pushchair as it has covered him and made it lovely and dark in there. The BabyStyle Hybrid is marketed at as a travel system from birth and I am slightly sad it wasn’t released earlier as the carry cot is stunning but not something we have been able to review, however we have been using the pushchair with the car seat brackets and its worked wonderfully for us. If I nip to drop off Joshua at school in the car before heading somewhere after the brackets have been ideal to clip put on so our Maxi-Cosi Pebble Plus car seat fit onto the Hybrid frame. The brackets are available to purchase separately for £25. My initial thoughts at the BabyStyle Hybrid launch event were that the shopping basket was going to way too small, but I can report that I have had a total change of heart where that is concerned as on Christmas Eve I had to go on a mercy mission to the shops and collect some forgotten items. I have to say I am beyond thrilled by just how much the shopping basket did actually hold. 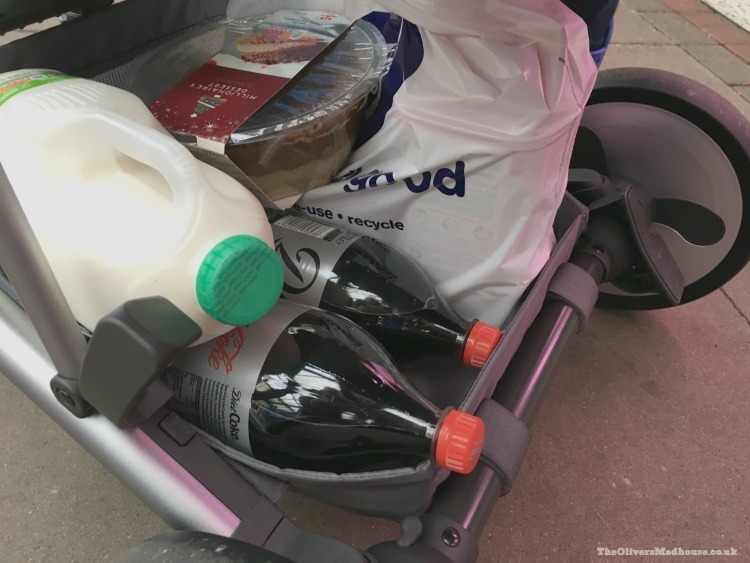 It held 2 1.75 ltr bottles of coke, a box of formula, 6 packs of wipes, a chocolate trifle and 4 pints of milk! Although I don’t tend to put that much under my pushchair it really did save my sanity! 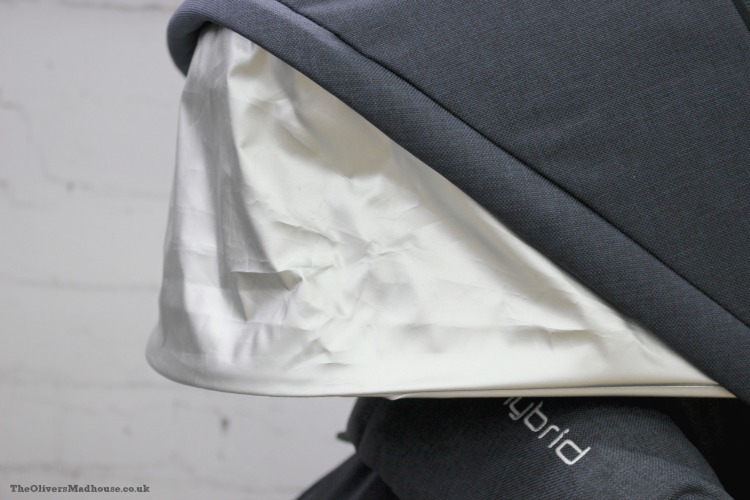 The Hybrid pushchair does come with the material apron for the front to protect little legs and help keep them warm but I have been really thankful that BabyStyle also sent me the winter footmuff too. 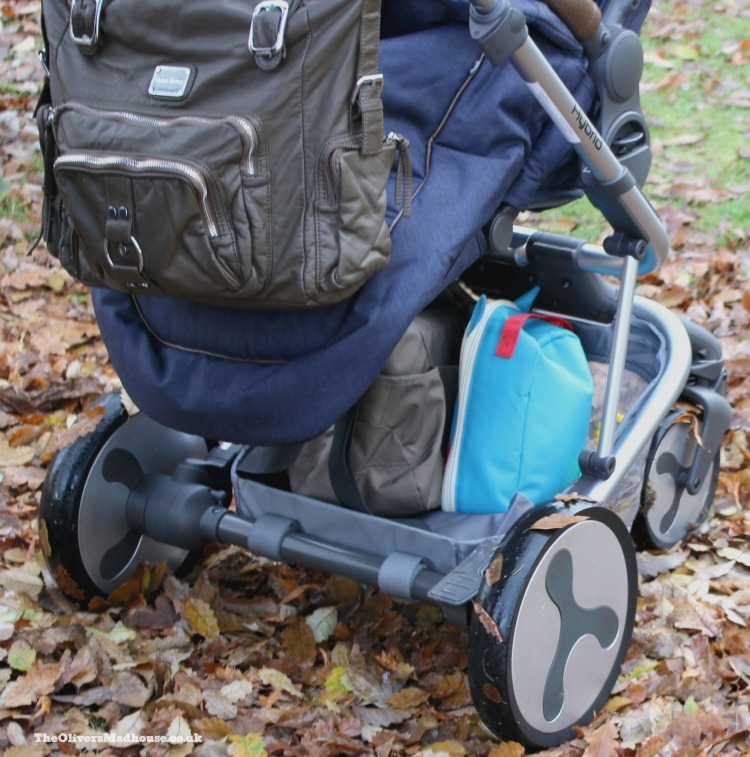 This normally is an optional extra and would cost £50 but with temperatures here dropping as low as -2.5 degrees we have been most thankful for it and with its super easy fitting design it only takes a minute to pop on and with it colour coordinating with the pushchair it really is a beautiful addition. 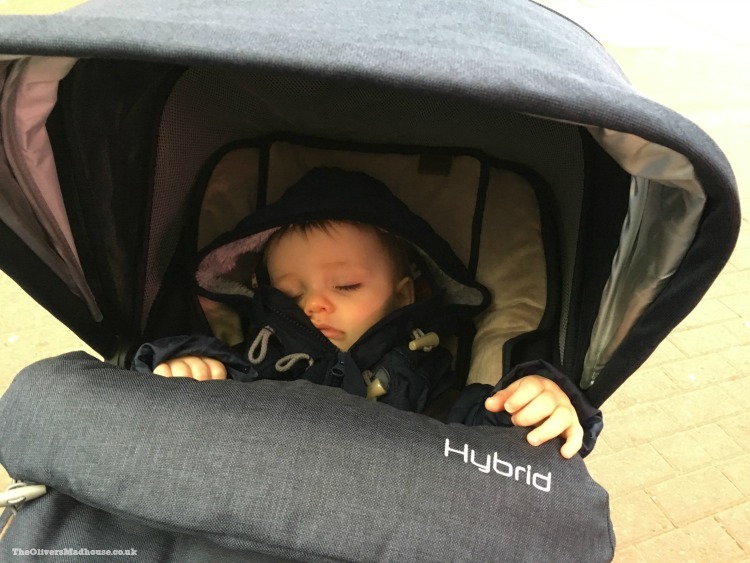 So far we have loved using the BabyStyle Hybrid Edge pushchair and am looking forward to testing it more over the coming weeks. Watch this space for an update later in January!